No chance to get prices per kg? Alternative guide to understand energy policy in Norway. As all fuel in Norway: Price is dependent on tax level/tax policy, tax level can be changed on short notice, without any obvious logic or “sound reason”. 1) Tax level on LPG was suddenly raised in order to keep/maintain electricity as the main energy source in households. 2) Reason: Price on electricity has increased/gone up, because of increase in export of hydroelectric power (electricity), to continental Europe. 3)Negative side effect of increased cost on electricity: LPG became a new and attractive alternative for Norwegian households. 4)Problem: Households using LPG are obviously trying to evade tax, and to increase air emissions. 5)Solution: Introduce a new tax on LPG with specific purpose to keep electricity as main source of energy in Norwegian households. 2) Power plants has been paid for long time ago. Electricity is very cheap to produce. 3) Government decide to make some profit, builds export cables to continental Europe, sell electricity at European price level. 4) A sudden problem/crisis seems to show up every cold and dry winter (pretty often): Water reserves for power plants is suddenly critical low, the water has been used to produce “export” electricity for continental Europe. 5) Attempt to find reasonable solution: Why not use one of the “reserve”/”stand by” power plants, located close to processing/export plants for natural gas? -Sorry-Can not do- it will violate national policy on air emission. 6) Final solution benefiting the greater good: Import electric power from continental Europe, they have plenty surplus electricity capacity for export. They just need to start up old power plants running on coal. -THEY are polluting, we can not judge them for this, but may good have mercy on their souls. -Do not question export of dirty hydrocarbons, this export is important for Norway. Export of hydrocarbon finance an increasing number of civil servants working on environment issues. We have an moral obligation to give advice on environmental issue to the rest of the world. Please forgive simple language, and lack of spell control. Experts might give a better explanation, with more details, using better English / better choice of words. 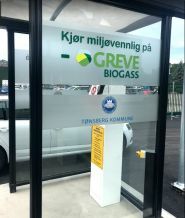 The CNG Station in Rypefjord is currently under deconstruction. 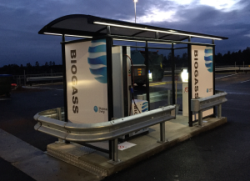 When we were there last month we were told that unfortunately the station is closed but the closest available CNG station is in Boden, Sweden. So if you are going north, don’t count on this station.